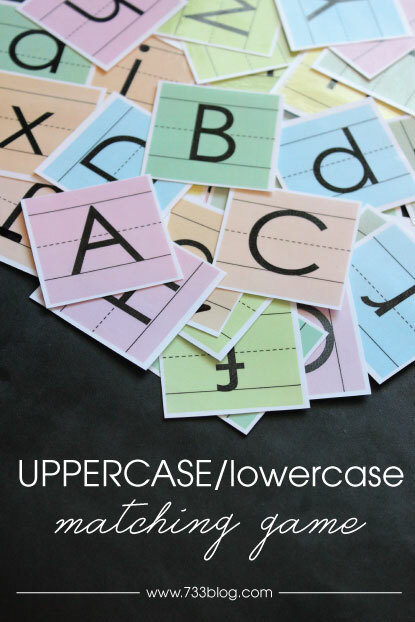 Olivia came home from daycare the other day with a bag of flashcards that had each lowercase letter and each uppercase letter and directions on how to play a matching game. She is pretty versed in letter recognition, but she loved the game and it helped her with quick recognition of each letter. When Monday came and we had to send the game back, I decided to make her one of her own! My two younger kiddos used these cards in so many ways! They played the matching game, but they also used it for sorting colors, and I would say simple words (ie, Cat, Dog, Mom, Go, Dad) and she would sound them up and spell them using the letters. You’ll notice I included lines on each card. Our school system uses Fundations as a way to teach letter formation, etc to elementary students which includes the sky line, plane line, grass line and worm line of writing. 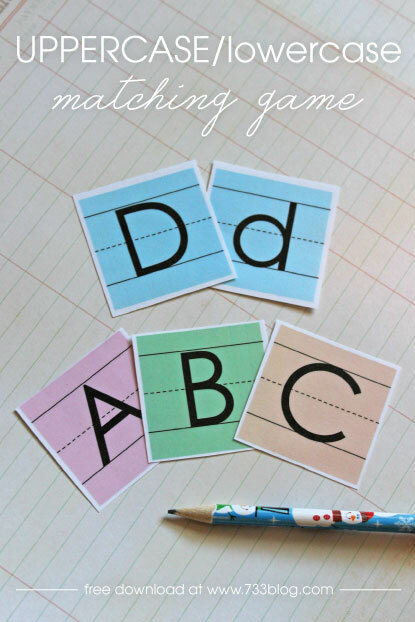 If you want more information on that, do a Google search for Fundations Letter Formation and you should be able to find tons of pdf downloads available. Olivia has been learning about these, which is why I wanted to make sure to include them. 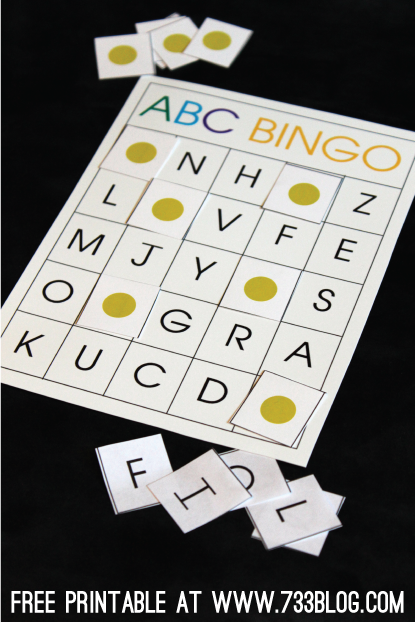 The game is very easy to play, and for those children that are starting to work on letter recognition, this is going to be perfect. 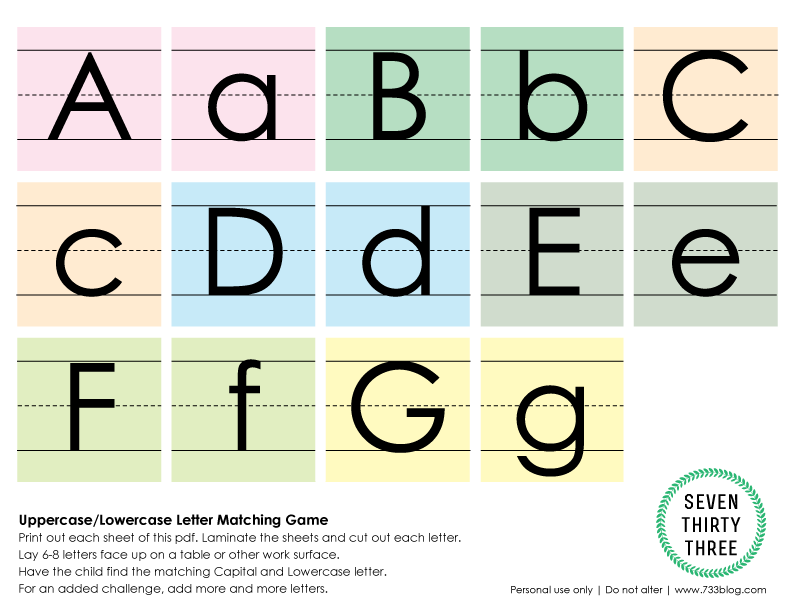 Download the Uppercase/Lowercase Letter Matching Game. Directions are included with the pdf, but feel free to think up your own way to use these! « Make this Valentine’s the Most Memorable One Yet! Thanks! Pinned. 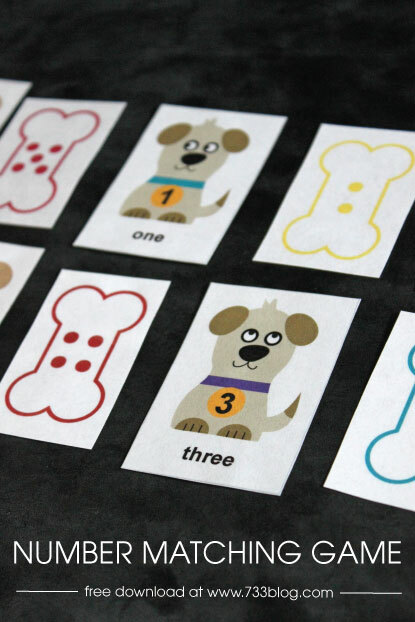 Cant wait for the dog number printable. I keep trying to print this and I keep getting an error code. You’re going to want to actually download it to your computer, open it with a PDF reader and print that way. I hear a lot of people have issues when trying to print directly from the link. To download it, follow the link, then click the little downward pointing arrow. Save it to your computer. I am so excited to use this with my Pre-K students. Love the simple, classic design!